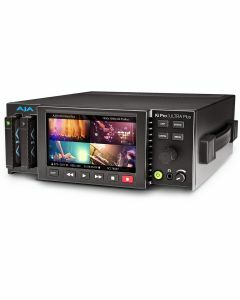 Ki Pro Ultra Plus is a multi-channel Apple ProRes recorder offering up to 4-Channels of simultaneous HD recording, or in Single-Channel mode a 4K/UltraHD/2K/HD Apple ProRes, Avid DNxHR MXF for 4K/UltraHD or Avid DNxHD MXF recorder and player. Ki Pro Ultra Plus supports the latest large raster high frame rate workflows, up to 4K 60p with HDR playout and recording. Designed to be either portable or rackmountable with half rack wide, 2RU high dimensions, it’s well suited for use in any environment. Explore the device’s broad feature set – from HDMI 2.0 connectivity with HDR playback to a dedicated web UI for remote control, the Ki Protect feature to ensure data integrity, a three-year warranty, dedicated support and so much more. Simplify your multi-camera productions by running up to four cameras per Ki Pro Ultra Plus and save power, space, time and effort on set, in the studio and when setting up OB trucks. Ki Pro Ultra Plus even allows independent profile support per channel in Multi-Channel mode; select high resolution Apple ProRes HQ for high quality finishing and use a second input to record Apple ProRes (Proxy) for an efficient editing pipeline. Starting with input 1, add channels as needed in order when utilizing like raster size and frame rate, and record your HD Apple ProRes files on the same AJA Pak media. Ki Pro Ultra Plus even allows rollover to a second Pak for hours of uninterrupted multi-channel recording. Multi-Channel recording with Ki Pro Ultra Plus provides individual, discrete recordings for each input that are timecode accurate and ready to be imported directly into a multi-channel editing sequence. No additional conversion or software is required, just drag and drop the files directly from the Pak Media into your edit. The clip naming convention is yours to customize to suit your needs, but each multi-channel file is always appended with .1, .2, .3 or .4, making it very easy to track assets in post. New Multi-Channel independent file naming support with firmware v4.0 also allows an independent additional name to be added to each recorded file for further identifying specific information for the project's needs. Losing one or even several feeds during a multi-channel shoot can cause major sync issues during the editing process that can be lengthy to resolve, if they can be resolved at all. But Ki Pro Ultra Plus is designed so that as soon as a loss in signal is detected on any of the inputs, a color bars frame with the legend “Loss Of Signal” is recorded until the input is restored or the shoot ends. In this way, all multi-channel clips have the same timecode duration and will align perfectly within any NLE. The editor then just simply cuts away from any recording that lost signal, without any heavy lifting to insert frames, or adjust audio to compensate. This function works with each input to Ki Pro Ultra Plus and will even function in Rollover mode, meaning that a loss of signal that spans separate media will pose no issues in editing, the time code of each file recorded being equal. New Forced Rollover support allows users to force a rollover recording to the second Pak port at any point, allowing quick extraction of the first Pak drive for fast transfer to editing environments, playout servers and more, while recording continues. While recording, the file header is then continuously updated every time new data is written. That way, the only loss that should be incurred is the last few frames that were in transit to the media drive to be recorded when the operation was interrupted. Frames that are already recorded will be preserved and are recoverable, providing greater peace of mind on set and in the studio, essential for multi-channel recording. A single cable can affordably transport both UltraHD or HD video and clean 24-bit 48 Hz 8-Channel audio to or from common HDMI 2.0 devices for a simple setup; perfect for independent producers, editors, ProAV, and anyone seeking to utilize the latest affordable capture and monitoring tools. Ki Pro Ultra Plus provides this support for your 4K/UltraHD/HD HDR pipelines to HDMI compatible displays, in free v2.0 firmware, by generating HDR metadata in accordance with HDMI v2.0a/CTA-861.3. Ki Pro Ultra Plus also provides support for Hybrid Log-Gamma (HLG) HDR displays over HDMI. Next generation 4K/UltraHD 50/60p recording and playback are attainable all the way up to Apple ProRes HQ when using AJA Pak Media with Ki Pro Ultra Plus. Any shoot or project benefits from the fabulously rich colors and smooth gradations across the luminance and chroma range that 12-bit makes possible with full 4:4:4 support including Apple ProRes 4444 XQ up to 2K 50/60p. VFX work benefits from Ki Pro Ultra Plus’ 12-bit support on 4x 3G-SDI input to captured Apple ProRes 444 files, resulting in clean green screen plates across the 4K/UltraHD/2K/HD raster landscape for easy and detailed postproduction manipulation. With full HDMI 2.0, you can monitor it all from 4:2:2 YCbCr to full 4:4:4 RGB in 12-bit. Ki Pro Ultra Plus records 4K/UltraHD/2K/HD to six quality levels of Apple ProRes including Apple ProRes 4444 XQ with support up to 2K 50/60p. This lets you choose the balance of image fidelity and file size that’s right for each individual production as well as having the flexibility to record directly to native file formats that are understood by most major editing systems. Next generation UltraHD 60p and 4K 60p recording is attainable all the way up to Apple ProRes HQ when using AJA Pak 1000, or AJA Pak 512 and Pak 256 SSD media. New Ki Pro Ultra v3.0 firmware allows users to record 4K and UltraHD rasters with Avid codecs within a native .MXF wrapper, supporting Avid editors and native .MXF workflows with more flexible options. Ki Pro Ultra Plus allows you to use the file system that suits your needs. Full flexibility is provided to format your recording media as either exFAT or HFS+ within Ki Pro Ultra Plus itself or from your desktop computer, ensuring wide OS compatibility. Pak media can also be ordered in either format for fast implementation upon arrival. Ki Pro Ultra Plus offers up to 16-Channels of audio support embedded over SDI or Fiber per input, bringing a total of 64-Channels of high quality recording when in multi-channel mode. Flexible routing options mean that 8-Channel only outputs like HDMI, Analog and Digital carry options for selecting the 8-Channel group required. Monitoring via the headphone jack on the front of the unit is split into easy 2-Channel groupings by input for on-set checks. Pak 2000 and Pak 1000 are the perfect companions for Ki Pro Ultra Plus offering 2TB or 1TB of fast SSD media for up to 4K recording at 60p in ProRes HQ. Pak 512 and Pak 256 models offer equal performance in smaller capacities when needed. Pak Media may also be used with the optional Pak Dock which features USB 3.0 and Thunderbolt connectors for lightning fast data transfers from and to your desktop or laptop. Pak-Adapt-eSATA (sold separately) is a Pak Media sized adapter with an eSATA connector that allows the user to attach a qualified RAID or single volume storage via an eSATA cable so that it may be used as a recordable drive. eSATA connectivity provides the bandwidth needed for 4K 422 HQ at up to 30 fps. You can even connect two Pak-Adapt-eSATAs to the Ki Pro Ultra Plus for more flexibility in the field. Ki Pro Ultra Plus features a beautiful high resolution HD display for pristine monitoring of your material and serves as your interface to Ki Pro's familiar and intuitive menu system. The detailed overlay UI includes onscreen keyboard functionality and a clear view of the powerful yet simple to operate UI, all pristinely presented on the 4.8” 720p LCD display. The large LCD provides detailed playback and monitoring perfect for onset use, the OB truck, helicopter or studio and it’s transparent menu overlays can be set at just the level the user prefers. Ki Pro Ultra Plus offers control over brightness of the display for flexible control to suit your working environment. Ki Pro Ultra Plus' fully integrated fiber inputs and outputs means Ki Pro Ultra Plus can be integrated directly to a dedicated fiber network alongside many other fiber products. Fiber allows outgoing and incoming video signals to be transmitted as far as 10 km away. The optional fiber transmitters let you choose from multiple wavelength CWDM SFPs, allowing advanced multiplexing of signals over a single fiber connection. RS-422 control allows Ki Pro Ultra Plus to integrate easily with supported editing systems and external controllers allowing it to fulfill several of the functions of a traditional VTR. Supported NLEs can even perform assemble edits directly to the Ki Pro Ultra Plus. In a truck or a machine room, Ki Pro Ultra Plus is equipped for advanced remote control and configuration. With a standard Ethernet LAN connection to a host computer and any web browser, all Ki Pro Ultra Plus parameter settings, clip selection and transport controls can be controlled; no additional or special software installation is required on the host computer. Multiple Ki Pro Ultra Plus units can even be controlled from a single web interface making Ki Pro Ultra Plus an ideal solution for multi-camera recordings.